While making the choice concerning Preschool’s location and its building we took under consideration the important needs of children like sleeping and playing during the day in home atmosphere. We especially considered the building to be placed far from the traffic, in a quiet environment, and what’s most import, safe environment, so that children can enjoy calm and comfortable play in the fresh air outside. The preschool building has a private garden. Because of the air pollution that occurs in Kraków, we try to protect our children from it as we can. Before going out for a walk the Teachers check the level of the pollution and if it is on a dangerous level to the health of the little onces, we don’t take them outside. The air in the Preschool is being filtered by a special air-filter that eliminates dangerous PM25 and PM10 dust. 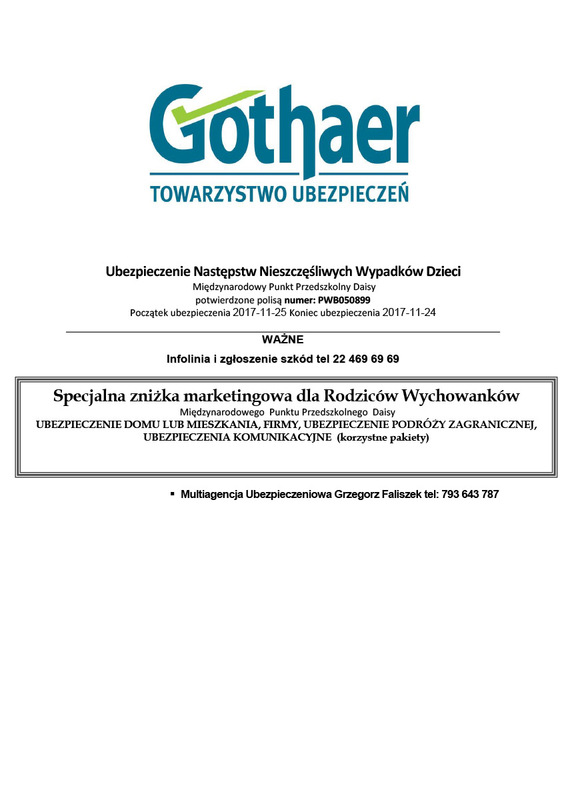 Oczyszczacz powietrza został przekazany przez Marszałka Województwa Małopolskiego w ramach realizacji projektu zintegrowanego LIFE pn. 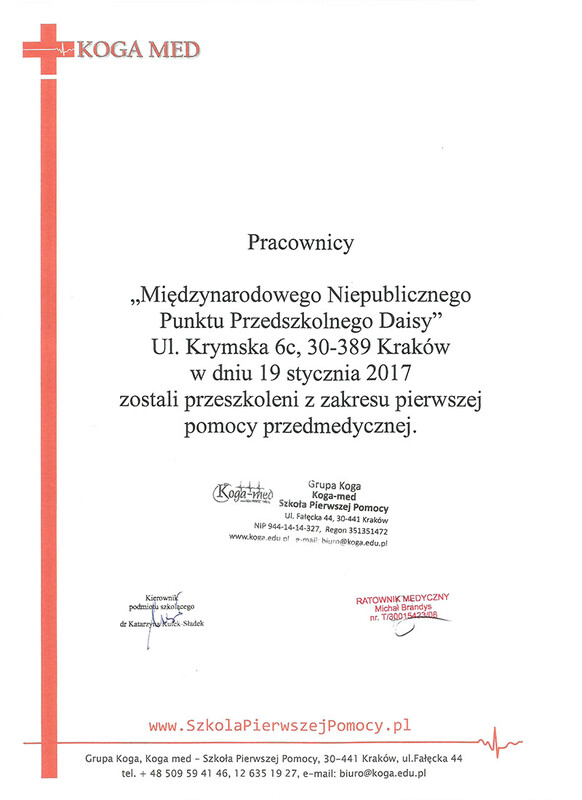 “Wdrażanie Programy ochrony powietrza dla województwa małopolskiego - Małopolska w zdrowej atmosferze” współfinansowanego ze środków Programu LIFE Unii Europejskiej. All employees working at our Preschool have current doctor’s and SANEPID health reports. Parents before registering their children are asked to bring doctor’s report that states that the child is at health to attend a Preschool. Children and employees have a separate pair of shoes to use in the Preschool that are kept on different clean shelves’ – each child has two separate shoe shelves’ in the cloakroom, one for the Preschool shoes, one for the outside shoes. The guests and parents visiting the Preschool are asked to put on disposable folio shoes to keep the surroundings clean. The employees after entering the Preschool wash their hands, change their outfit for Preschool clothes. Children have their hands washed before and after the meals, after playing outdoors, going for a walk or playing indoors. This procedure certainly applies to the employees as well. Hygiene is one of the first priorities at our Preschool, we obtain in with everyday hygiene routines and disinfection of proper surfaces. All the room surfaces and toys are disinfected once every week. The vacuum cleaner used here is equipped with a HEPA filter that absorbs 99,7% of bacteria, viruses, and dust, it Has been chosen especially for the needs of our Preschool. The paint used for coloring the walls at the Preschool is cleanable, hygienic, it has antibacterial, antifungal features, has all the necessary certificates. Children have their own separate toilet with a washing sink designed especially for their needs, the staff uses their own toilet. In case of an illness the parents are asked by the Preschool’s management to keep their children at home until they get well, this applies to the working personnel as well. We are aware of numerous children accidents that take place in homes. They are often caused by deficient caution. Daisy International Preschool has minimized the risk of possible accidents using the maximum of security tools. All the jacks are protected with covers and electricity intake is cut off totally. All the wall edges and corners are protected with covers, so that we are sure about the safety of our children in case of falls. The radiators In Daisy International Preschool are all covered with wooden protectors, so that children do not have direct contact with the heating surface. All the toys at the Preschool have certificates for children’s use. Temperature in our preschool is always being controlled. Only healthy children are being accepted for care at our Preschool, in case of a health problem that occurs at the Preschool parents are informed immediately by telephone and are requested to pick up their child from the Preschool. During the convalescence children stay at home. We thoroughly pay attention to children’s nutrition. We have prepared an offer of catering nourishment. The catering company is certified to provide food for children. Children have breakfast, soup, lunch and snack in our Preschool. The menu for children is being prepared with extreme care for their needs, parents have the possibility to view the menu each week. We want children to try new healthy tastes and to gain adequate healthy feeding habits. In case of allergic problems to certain product we consult the parents and prepare special menus. The beverages are prepared from bottled water, appropriate for children.